Target: Girls 8 to 14 years old. Headline: Your best friend hates you. You have to mutilate a frog in the name of science. Your secret crush isn't so secret anymore. What's a girl to do? Body copy: OK, life doesn't really work like that. But it's what Purple Moon adventures are all about. You choose who to ignore, who to hang out with and who you can really trust. If you make a mistake, jump back a step and fix it. If you really screw up, start over. It's the reason computer games were invented in the first place. Don't you wish your life was like Purple Moon? 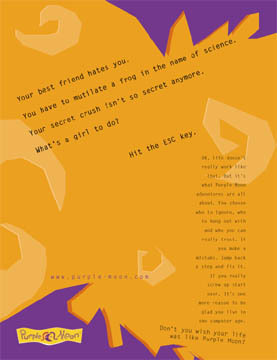 Tagline: Don't you wish your life was like Purple Moon?